DreamMaker Bath and Kitchen is proud to announce that we were named No. 6 on the prestigious Remodeling 550 list, an annual ranking of the largest remodeling companies in the United States. 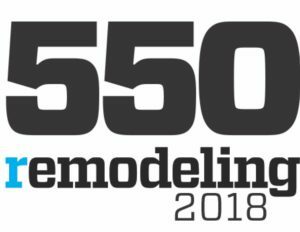 The Remodeling 550 is published by Remodeling magazine, one of the foremost authorities on the home improvement industry. “Becoming a Remodeling 550 company indicates that you have quality and staying power – two traits that customers value most,” said Remodeling Editor-in-Chief Craig Webb. The magazine’s data shows a positive financial picture for the brands that made its list. According to Remodeling Magazine, “The top 300 full-service remodelers earned 8% more in revenue in 2017 than they did in 2016.” With more than 100,000 remodeling companies in the country today, the brands on this list represent the top 0.5% of the industry. DreamMaker has also received the GuildQuality Service Excellence Distinction. GuildQuality is an independent home improvement industry survey firm that partners with Remodeling Magazine each year to measure customer satisfaction. The distinction recognizes brands in the Remodeling 550 who achieved a recommendation rate of at least 90%. In addition, our company and the Springfield, Greater Grand Rapids and St. Louis Park locations are all past members of the magazine’s Big50 list, a designation that recognizes the long-term financial and operational success of its recipients. The long-term success and growth of the DreamMaker brand provides a major advantage for anyone looking to start a new business or grow their existing remodeling company. Remodeling magazine notes that one-sixth of remodelers go out of business every year. “In contrast, the bigger firms have a failure rate of less than 2%,” said Webb. Our experience, knowledge and reputation for excellence help our franchise owners get started with a better chance of success than they might have on their own. DreamMaker is committed to helping every one of our franchisees put their best foot forward from day one, and every day after, with our extensive franchise training and support. If you choose to open a DreamMaker Bath and Kitchen, one day you might find yourself on this list.